Tranmere forward Adam McGurk is poised to win a first Northern Ireland cap against Malta on Wednesday three years after quitting football in despair. McGurk, 24, initially called time on his career in early 2010 after being released by Aston Villa after an injury-plagued spell at the club. "It was my family who got me back into it," said McGurk in Valletta. "I didn't really have any interest myself being honest, but I didn't want to disappoint them." McGurk added: "I didn't really know what to do, I was in a bad place at that time." However, McGurk's family convinced him to begin a spell at non-league Hednesford Town and his career was back on track the following summer after a successful trial at Tranmere. "I eventually got a chance at Tranmere and I took it. This is where I am now so I'm just grateful." With strikers Kyle Lafferty and David Healy missing for Wednesday's friendly in Valletta, McGurk looks likely to play a part in the friendly. And with Lafferty suspended for next month's World Cup qualifier against Russia, McGurk is hoping to impress Northern Ireland manager Michael O'Neill. "I was a bit shocked when I got the call-up, I had to phone the club to make sure it wasn't someone trying to take the mick. "I didn't know Michael was at the games he came to watch but luckily I must have done OK.
"He phoned me after the squad was announced to say he was impressed and he was looking forward to seeing me." McGurk is one of a number of new faces in the squad for Wednesday's friendly, where O'Neill will hope to secure a first win at the eighth attempt. Alex Bruce is also in line to win his first cap after previously representing the Republic of Ireland. Bruce, the son of Hull City manager Steve Bruce, acknowledges that his presence may not be welcomed by all Northern Ireland fans but he remains unruffled. "Any footballer will tell you that when you walk over that white line, what people do on the terraces, you're quite oblivious to it," said Bruce. 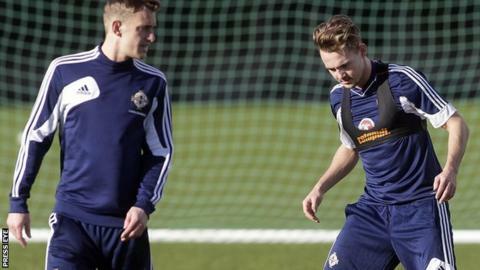 "I've declared myself for Northern Ireland, Michael's given me a fantastic opportunity to play international football. "My granny's from Bangor (county Down) so I always knew, when I hadn't played a competitive game (for the Republic) that I was still available." Previous Northern Ireland manager Nigel Worthington made the initial moves to secure Bruce's allegiance but the switch was only confirmed last year. The Hull defender has been named in O'Neill's last two squads but had to pull out because of injury. Despite a minor ankle "tweak" in training on Monday, Bruce is confident that he will be fit for Wednesday's game.